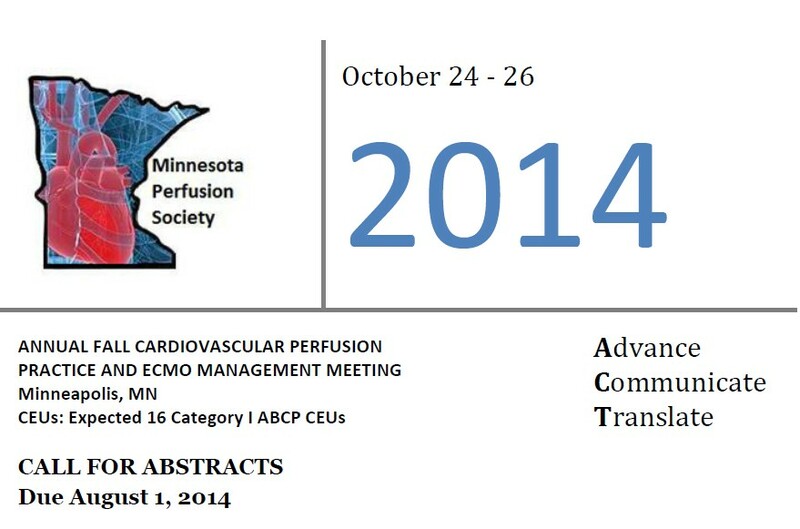 On behalf of the organizing committee, I would like to announce the Annual Fall Cardiovascular Perfusion Practice and ECMO Management Meeting in Minneapolis, MN from October 24-26, 2014. The venue will be the Radisson Blu Mall of America, conveniently connected directly to Mall of America, the largest indoor entertainment and shopping mall in the United States. The topic for this year’s conference is ECMO and cardiovascular surgical patient case management.We will also be having a perfusion crisis simulation and an ECMO high fidelity similation session on Friday afternoon prior to the plenary sessions. Abstract submissions are now being accepted and need to be submitted to Dirck Rilla dirck.rilla@comcast.net* by August 1, 2014. If you are interested in attending the meeting, registration is now open through the MPS websitee: http://mnperfsoc.org/meeting/meetingregistration.html. Thank you for your time investment and contribution to this year’s MPS continuing education meeting.